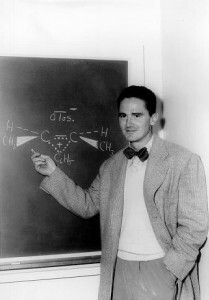 Donald J. Cram, a Nobel Prize-winning organic chemist, came to UCLA in August of 1947 where he taught and conducted research for more than four decades. The field of host-guest complexation chemistry was in large part developed by Cram and his research group at UCLA. Through this work, the interactions between enzymes and their substrates in a living cell were mimicked using synthetic molecules. The creation of this field led to his Nobel Prize in Chemistry in 1987 and the President's National Medal of Science in 1993. Portions of his papers were recently processed and are now available for research. Students and colleagues fondly remember Cram wearing his signature green bow-tie and carrying a satchel filled with molecular models made of plastic, symbols of his passion for sharing his love of molecular architecture. Not only does this collection include these models but it also contains his Nobel Prize medal and his favorite bow-tie. 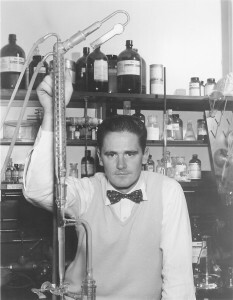 According to Cram's Nobel autobiography, "Chemical research became my god, and the conducting of it, my act of prayer, from 1938 to the present." This spiritual journey and Cram's academic mastery of organic chemistry began with a B.S. from Rollins College in 1941, followed by an M.S. from the University of Nebraska in 1942 and finally a Ph.D. from Harvard in 1947. During his prolific career, Cram authored more than 400 publications, including seven books – all originally handwritten in pencil. This collection also holds an abundance of his annotated drafts. When Cram wasn’t conducting experiments, transcribing his research and publishing, he was at the chalkboard inspiring future chemists. Cram taught organic chemistry to approximately 12,000 undergraduates and reached tens of thousands of additional students through the three textbooks he authored. The best known is Organic Chemistry, co-authored with George S. Hammond of Caltech, which has been translated into twelve languages, and revolutionized the way organic chemistry was taught in an academic setting. In addition to Cram’s accomplishments and numerous publications, he is often remembered for his competitive spirit and athletic ability – particularly his love of surfing. Cram’s scrapbooks provide colorful evidence that he enjoyed conducting research in the laboratory as well as weekends at the beach searching for the perfect wave. Although he died in 2001, his contributions to the field of chemistry continue to thrive. 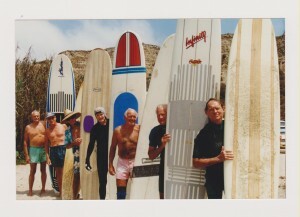 Cram, fourth from left in black wetsuit and gray cap, with his surfing club friends, a group known as "the old guys" at San Onofre beach. Researchers interested in organic chemistry will find much to investigate in the collection's correspondence, lectures, UCLA theses and dissertations, grant files, patent notebooks, photographs and honorary medals. Additionally, the UCLA Center for Oral History Research conducted an interview with Cram entitled “Times of My Life: Donald J. Cram” which is accessible via Library Special Collections.